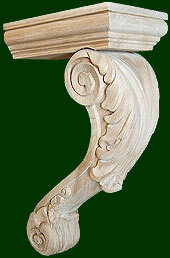 this can be cut down to 34 5/8"
Many of our corbels are carved out of domestic as well as imported woods, such as maple, cherry, oak, walnut, alder, soft maple, ash, pine, mahogany and teak. 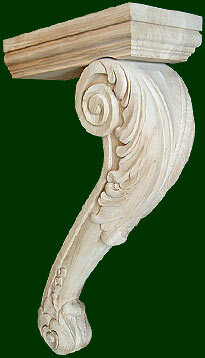 In history wood carved corbels have been used in many historical buildings such as churches, palaces, museums, period historical homes and many landmark buildings. It is possible to use reclaimed lumber in the carving of our corbels, as many people like to use reclaimed lumber in historical restoration.